Seems KATV is having a difficult time finding a replacement for former weekend anchor Heather Crawford. Since Crawford's departure in mid August it seems every reporter and weekday anchor has popped up as the weekend anchor. I would bet it's difficult to find a quality anchor just for the weekend as with quality you have to pay well. KTAL is getting several new staff members. In this week are Stephanie Claytor and Kimberly Rusely. In coming weeks Dan and Jacque Jovic (a husband and wife team) will be in to coanchor the morning show and 10 pm weekday shows. Lots of changes to go along with the new HD set and all in time for sweeps. Dan and Jacque Jovic come to KTAL from WJW, FOX 8 in Cleveland, Ohio. In his goodbye video for FOX 8 Dan says he will be morning anchor and provide occasional reporting both on-air, and online. Also in the video Jacgue Jovic says she will be KTAL's evening anchor. We apologize to DirecTV customers for the continued signal issues. Direct can't seem to isolate the issue. For a clear signal, we suggest using an antenna. The issue is only on DirecTV. We also suggest calling Direct and letting them know you aren't happy with the signal. This from a tipster: Chuck Maulden out as KTHV news director. Maulden came to Channel 11 in October 2007. Before that he had been news director at KSDK-TV in St. Louis Mo. A Louisiana couple claiming to have lost everything in Hurricane Isaac used Channel 12/KSLA to lure donations. According to KSLA, it all started when they got an email from a citizen telling them about Maston and Amanda Humphries who supposedly lost everything in the recent storm. Well, it was all a scam. BUT it took the airing of the story for the truth to come out. The couple were arrested Friday night in the KSLA Lobby. Read the complete story HERE. The Louisiana Lottery recently left KTAL and returned to their original station KTBS/KPXJ. Three weeks in and KPXJ is having daily problems airing the show. The parents of Anne Pressly are pressing the Arkansas Supreme Court to reinstate their lawsuit against St. Vincent Infirmary Medical Center and three people who snooped at the medical records of the Little Rock anchor. The Arkansas Democrat/Gazette reports," Pressly’s parents, Guy and Patti Cannady, contend they should have been allowed to pursue a claim of outrage in Pulaski County Circuit Court because of the emotional harm they experienced upon learning that a doctor and two hospital workers, none of whom had any connection to Pressly’s case, illegally accessed her medical records simply to satisfy their personal curiosity. Arkansas Business.com reports KATV senior vice president and general manager Mark Rose has been to promoted to president of the top rated channel. Rose began work on channel 7 in 1988 as an account executive and was promoted to general manager three years ago. Yea this is old news but just came across this today.....KARK news crews were out and about covering storm damage around the first of month when out of no where a naked man came out of the woods. The news crew continued to film. The hardened criminal, 22-year-old Nathaniel Koba, was later arrested and charged with public intoxication and indecent exposure. Watch the video HERE. The ADG says Cummins no longer lives in Arkansas. No criminal charges were filed in the case. 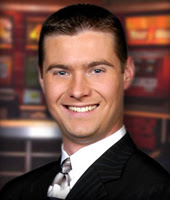 Morning show weatherman jason adams' (kfsm) contract was not renewed. he will be leaving soon. One can only wonder what the thinking is behind KTHV's/Channel 11 anchor go round. 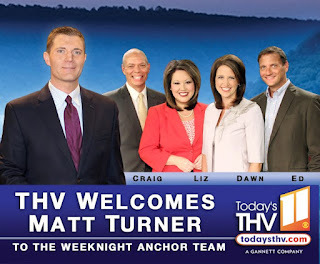 Matt Turner officially began at the station as the main anchor for 5,6, and 10..along with Dawn Scott. Ever since then it's been a guessing game on who viewers will find at the anchor desk. Just like today it's Liz and Dawn and Ed in the studio with Matt out and about being a reporter. Now we ask where is Craig! For the station's sake we hope this doesn't continue. I think 11 realizes it has too many anchors and doesn't want to rock the boat in getting rid of someone. Hmmm, so from what I can gather the new anchor team is Matt, Dawn, Ed and Mark. BUT like some viewers are pointing out where is Craig and Liz? Where do they fit in the picture. I didn't catch the evening newscasts but will the 10pm program. Still a lot of questions rather than answers at this point but I guess we will all find out what happens to Craig and Liz. UPDATE: Matt Turner just said Liz and Craig are "off tonight". 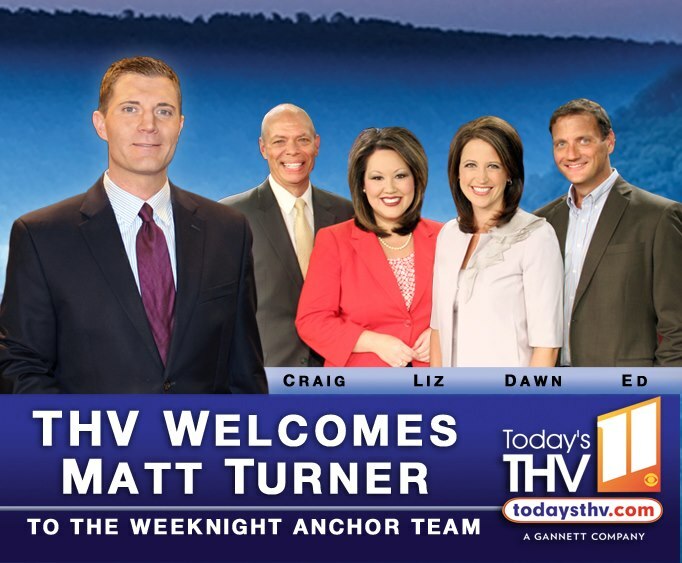 Matt Turner officially joins the team at Today's THV/Channel 11 on Monday. Turner will be anchoring the 5, 6 and 10 newscasts with Dawn Scott. All promos feature the current anchors along with Matt. Will the anchor desk be too busy with too many anchors? I guess we will have to wait and see.